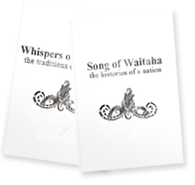 December 10 is a very significant date in this modern age in terms of the Waitaha Nation. I will go back to the beginning. In the mid 1980’s a decision was made by a senior elder of the time here in Te Waipounamu. Because of the pain of the people and the lands he decided that the time had come for the philosophy of Waitaha to be brought back into the World of Light, Te Ao Marama, ‘to heal the people and to heal the land’ because Waitaha are a people of Peace and adhere to the philosophy of Rongomaraeroa, keeper of all things peaceful, truth and aroha, compassion. Grace for the Planet… Wherever you are on Mother’s Day 2009, please share a simple intention with Mother Earth. We are sending positive thoughts and intention for healing the water throughout the planet as an act of respect and love for the Mother. This time of the year down here in the South Pacific Ocean is the changing of the seasons and is when Winter likes to make it’s presence known and so it was the eve of Mother’s Day 10 May 2009. I woke in the early hours of the morning to the Mother of all storms. I lay in bed thinking oh no my grandchildren are going to catch pneumonia in this storm if it continues. We were to gather between 7 and 8a.m. for the arranged ceremony at ‘sunrise’. And so I quietly asked for some relenting of the storm between that hour. We rose at 6 a.m., the storm was lashing the hills around us with snow flurries as well. But as we drove down the hill to the beach the storm abated and when we arrived, all was calm and quite mild. The storm could be seen raging in a huge circle over the city in the distance and out across the plains to the mountains, not that we could see them. About 30 people gathered together. We formed a circle and began with karakia and song. The process for the prayer was explained along with the intention and we were to go to the water and place our intention to heal the waters of the world and in turn bring balance and healing to Papatuanuku our Earth Mother. As we went to the sea one of the participants, a man, came to me with tears streaming down his face as he handed me this cylindrical object. He explained that while I was explaining the process for the ceremony he noticed this object being brought in on the Tide and that as he watched it come in it was deposited at my feet. We both wept at the beauty of this offering from Tangaroa the Water Entity of our people and culture. We all gathered back into the circle. I placed the ‘crucible’ in the centre of the circle along with a piece of pounamu and as we began our closing karakia and song, a tiny white feather drifted down from the heavens and landed alongside the gift from Tangaroa. It was such a precious moment, one of connection, oneness and unity. I was so grateful for my grandchildren being present to witness this and participate in this event. I was the last to leave the beach and as I was climbing up the bank to the roadway, Tawhirimatea, the weather entity, started to blow in a blustery way, as if to say, come one hurry up, have held my breathe for an hour to allow this ceremony to happen, time is up, be off with you!! And later that day we all gathered for the World Premier of Earth Whisperers, Papatuanuku in Sumner, Christchurch. Check out www.wickcandle.co.nz for more information of this film/documentary produced by renowned film maker, Kathleen Gallagher of Christchurch.